Blogging Break Poem . . .
la tercera, sí misma con palabras. como tinta de agua de luz de letras. adentro de castillos de sangre y huesos. ¿Que espera adentro la sombra de la cruz? con su corona y su nimbo unidos. 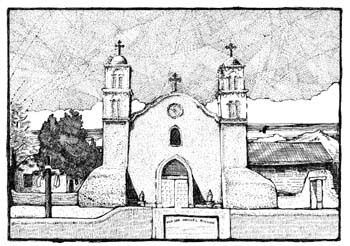 Drawing of San Miguel by A. Leon Miler. I found a Spanish version of my poem, The Cold River. Those of you who know Spanish will notice that it is quite a bit different from the English. That’s because the Spanish one has rested dormant on a hard drive, and, meanwhile, I’ve revised the English poem. Oh, and, as usual, don’t be too hard on me. Spanish is not my first language: no es mi idioma nativo. But sometimes I feel that it ought to be mi idioma natural. Let me tell you what is unique about the following poem. First of all, I wrote it. No, that doesn’t make it unique. It is because I am madly in love with metrical poetry, and I tossed metrics to the wind for this one. Secondly, I wrote it several years, originally in Spanish. This is the English translation. If I can find the original Spanish, I’ll post it some other day. You see, I have a lot of missing work due to moving files from my old laptop to my netbook. with a click and drum. that reach, but never meet. Let me tell you something else. I am in one of those moods that agitates me to the point that I don’t know whether I’m desperately in love with life and the world around me, or too tired and sad to feel that way. A good night’s sleep should solve my dilemma. Tomorrow I might know and maybe even understand the difference. Folk songs tell stories in a microcosm. Traditionally, they record stories of history, which do not always or often end happily. This is a song by Pancho Barraza that, several years ago, I listened to repetitively for its melancholic sound (many people have done this song, so I can’t say who is the original artist). I appreciate it for its simplicity, and for the way it tells a story in very few words. I’m not going to translate it for you, but will give you the gist: it’s a love story between two young people, a girl of 15 and a boy of 17. They fall in love in a spring wheat field, where there are butterflies flying from flower to flower and all around them. Then it is winter, and they are older. It’s a time without flowers. She’s a housewife, and he’s a poet (obviously, as the song is from his perspective, and only a poet could write a line like cuando hasta el alma se encuentra en flores). The song tells a story with a lingering sadness, perhaps from nostalgia. It doesn’t tell the whole story, however, and that is why it lingers in the mind. Did they stay together? Are they happy? It’s winter for them now, but that doesn’t mean they are unhappy, especially since they can hold onto their love by imagining the butterflies that they encountered in that afternoon so long ago. Yes, but who can really hold onto butterflies without crushing them? It’s a delicate business, for sure. There is danger in writing poetry. There is danger in venturing into the world, armed with verse. There is danger in displaying the poetry of the heart to the world. In that regard, Sor Juana was a hero and a warrior. For my part, I view Sor Juana as either my muse, or the bearer of the muse that in turn inspires me. Were the sonnets to flow in perfection from my fingers as they did from her ink-dipped quill, I would be trembling with delight. Instead, I’m still waiting, holding my breath–holding that inspiration inside until it pours out. Below is one of her sonnets that is all about risk. Sometimes, analyzing risk is paralyzing. I will post her sonnet, and then a translation by Margaret Sayers Peden*. Translations are tricky, and I often find that remaining true to the syllabic and rhyme may cause a loss of meaning. Sayers Peden’s translation is not at all bad, and you will understand the gist of the poem. ni al bravo toro osado provocara. quien con discreta mano lo enfrenara. estado que ha de ser toda la vida. or dare to bait the bull to frenzied rage. there’d be no reining hand to be obeyed. and never choose a state to last his span. 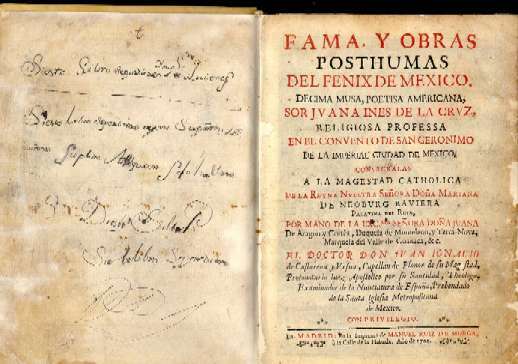 If you would like to learn more about Sor Juana Inés de la Cruz, the great Mexican poet and nun, click here. Tomorrow night, I will actually post a new flash fiction story by. . . me! *Both poems I copied out from Sor Juana Inés de la Cruz: Poems, Protest, and a Dream, published by Penguins Classics, 1997.